That was almost 20 years ago. The Old Navy was newly opened in San Francisco, Ca. Our grandsons, Phil was 6 years old, and the younger one, Gabe was about one. We were wandering around with the crowds in Old Navy. Window shopping! When we came to the third floor, Phil stopped at a portraitist’s drawing stand. watching the portraitist drawing, he was just about to finished his piece for a lady. I peeked at the finishing picture, it looked very nice, looked just like that lady! I had never had a drew picture. Why not have one today? so I sat in the seat after that lady left. I couldn’t see what the portraitist was drawing behind his stand, but I could see his arms were moving up and down, from left to right. Looked at me for a second and then went back working again. After he worked for a few minutes, he stopped again. This time was not just a couple seconds he looked at me. He put his pencil in between his front teeth and stared at me quite puzzled. Then he took the pencil out of his teeth, gave a strong knock on the drawing stand. With a mischievous smile and go back to work again. A few minutes later, he took the picture down from his drawing stand and handed it to me. It was me! I looked nice in it! I should say that was the best one I never had. I was very pleased with it. But……there was something there. I could not really tell. There was something in it!. As we were walking, Phil said: ” Nanny, let me see it.” I handed it to him. He looked at a picture , his little head slanting from left to right several times. Very displeased he handed the picture back to me and said: “Granny! It doesn’t look you!” I was surprised to hear it! “No? But I think it is very nice!” I banded down my back and showed the picture to Phil again. “No! Granny! Look at here.” Phil’s little pointer pointed at the eyebrows. And said:”Look! It has eyebrows, but you don’t” His litter finger sliding back and forth on my forehead where the eyebrow should be. There in the mirror, I saw me! Yes! Now I found that something unknown in that beautiful picture was my eyebrow. I do have some. But they were just too light and too thin! You have to look very close. Otherwise, You can hardly see! Here is a copy of Mona Lisa’s picture at top of this page which I found from Google. 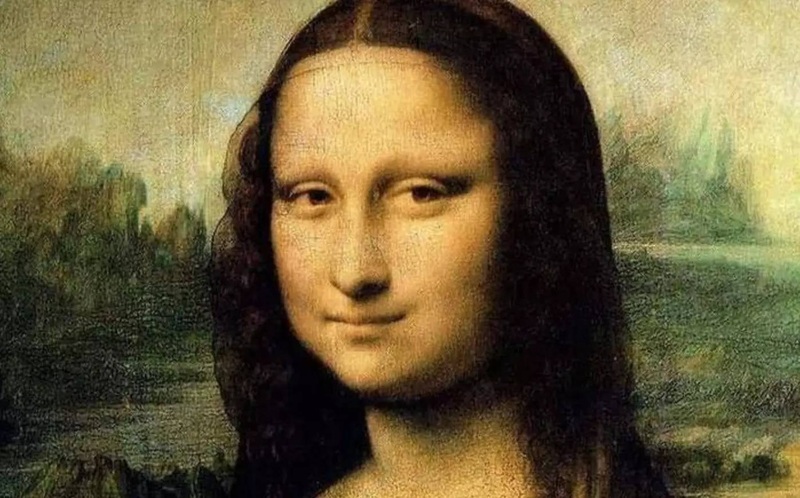 Have you noticed the Mona Lisa had no eyebrows! I’m so proud of myself to be another “Mona Lisa”! This picture of mine was taken this morning. Won’t agree with me?! Just a bit older!